iDVD is a DVD burning application developed by Apple. But there was no update coming for iDVD since Mac OS X Lion. Therefore, Mac users who are using Lion or later are no longer able to use this application, let alone those who have updated to Mavericks. If you are in this situation, you need to seek help from a powerful and professional iDVD alternative for Mavericks. Aimersoft DVD Creator for Mac is an easy-to-use yet powerful DVD burner that is fully compatible with Mac OS X Mavericks. It can help you burn videos in various formats to DVD. The supported input formats include MP4, FLV, AVI, VOB, 3GP, MOV, MPG, MPEG, WMV, MKV, ASF etc. In addition to burnning videos in Mavericks, you can also create amazing DVD slideshows with your photos. This program doesn‘t merely serve as a DVD burner for Mavericks like iDVD. It also works as a video editor, which gives you great support in making your DVDs more attractive. 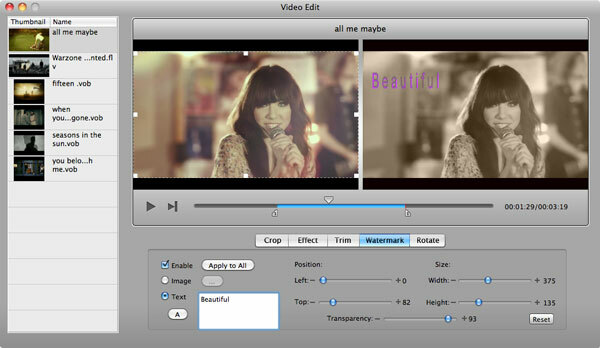 You can not only compile your videos with basic editing features, but also optimize the files with stunning effects. What's more, you are able to further touch up your DVDs with lots of free DVD menus and personalize the menu frames, background music and more. Besides, this Mavericks iDVD also allows you to save your videos as .dvdmedia and ISO files. Why not download and install the free trial of DVD Creator for Mac and then follow the instruction below to burn DVDs in Mac OS X10.9. The initial step is to run the program and then import your files. You can click the + button on the top right corner of the interface to add your files. Alternatively, you can also drag the videos directly from the local folder to the program. The loaded files will be listed in the right-side Media Library. You are able to adjust the playback sequence of the videos by clicking ↑ and ↓. If you want to fine tune your videos, you can click the Edit button on the video thumbnail. The interface for video editing will be subsequently activated. Here you are able to crop videos to cut off black bars, apply special effects to enhance videos, trim videos to remove unwanted parts, add watermarks to make the videos distinguishable, and rotate videos to correct the viewing issue, etc. All you need to do is to click the corresponding buttons under the windows. This program offers a bunch of eye-catching DVD menus. You can click the Menu button under the Media Library to choose the menus you like. In the Preview window, you can adjust the frame, button and text of the menu. If you'd like to personalize the title thumbnail, DVD menu background and background music, you can click Advanced Setting under the Preview window to access to the options. After you are done with personalization, you can click the Play button to preview the videos. If you are happy with the result, then you can click the Burn button to start the burning process. In addition to burning the videos to a DVD disc with preferred speed, you can also save your DVD files as .dvdmedia or ISO files. With this iDVD for OS X Mavericks, you can always burn your videos to DVDs to share with family and friends, send them as gifts and preserve your precious memory forever. gracia, espero me sirva, llevo buscàndola mucho varios dìas.